So there is MAJOR stuff going on around our house right now. Not only are we renovating our house, but we are planning a makeover for a wonderful family in Tennessee next week! We are crazy busy, but super excited because all of the stuff we have going on at our house is in preparation for our host daughter’s arrival. Like our new front porch! I cannot tell you how much I am loving our new front porch!! 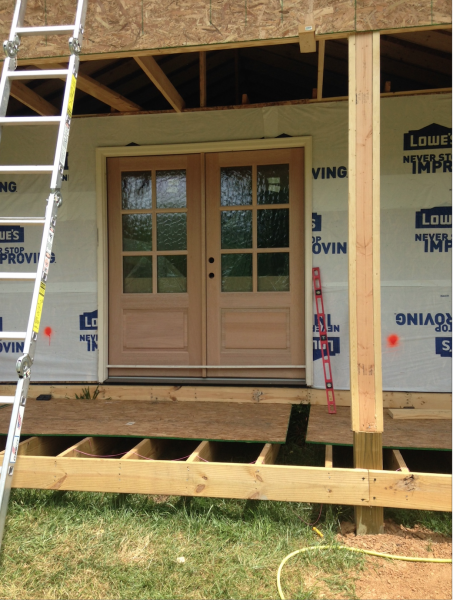 We got the shingles on and the door and windows installed yesterday! Yay! Okay, so the new front porch doesn’t “have” to be done for us to host her, but it is something we were wanting to do this spring before we decided to host her, and we are wanting it to be finished so we can just enjoy being with her. 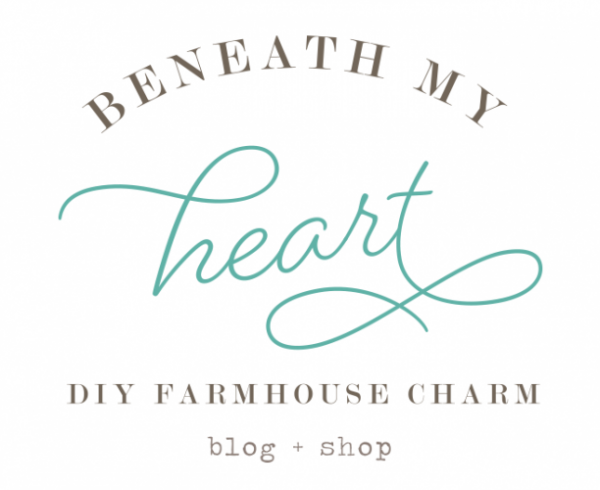 The new front porch is also going to create a new entry way with a new walk in closet for the boys’ backpacks and shoes, which means we can get all of that stuff out of the playroom so we can turn it into our host daughter’s bedroom. Don’t you love when events (like our host daughter coming) forces you to get things done on your to-do list that you have been putting off for years?! 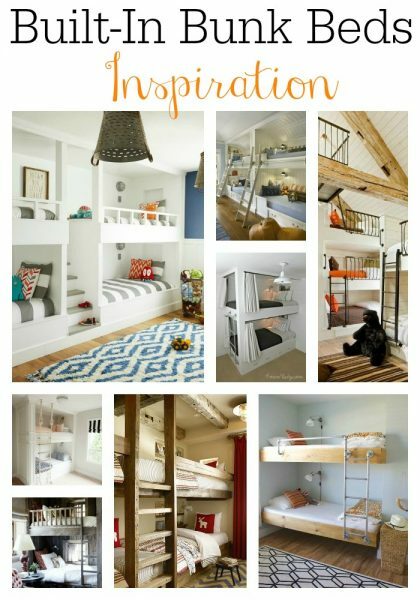 So, I wanted to show you some of my favorite inspiration pictures of bunk beds from Pinterest that I am using to help me plan Adam and Eli’s beds. « Heading to Nashville for a Spring Makeover with Lowe’s! I love these examples, especially the one with stairs and also the one with industrial piping. You dont sho the European semi enclosed style that’s very cozy and feels safer to me. Please consider the “L” configuation…you could use the bottom dead space for a desk. I like the last one with the built in stair case rather than a ladder. The one with the gray and white striped comforters. It would be easier to get in and out of, even when the boys are older. That’s the one I love the most, too. They are all beautiful. 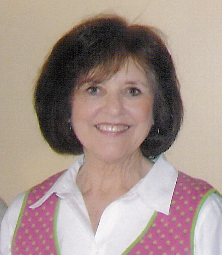 Thank you Lisa! I can’t wait to show everyone what we did! 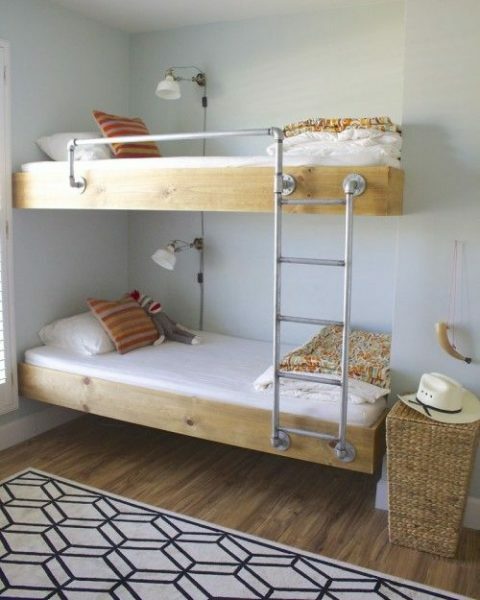 I hope that your boys have a bedroom with ceilings that are taller than the standard 8′ otherwise they will soon outgrow the bunk beds. 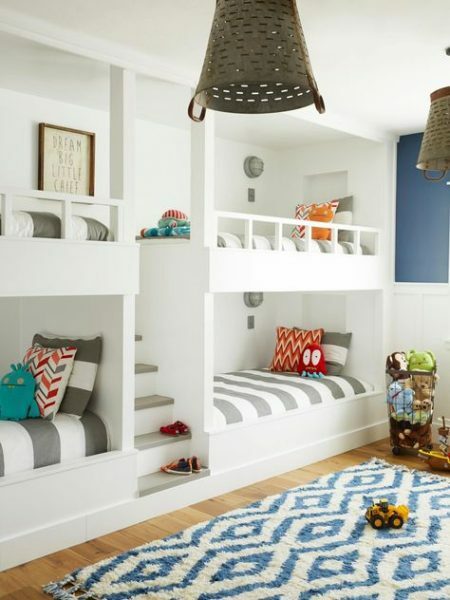 We had bunks for our kids but as they grew towards adult height, there just wasn’t enough height in the bunk beds for them to sit up comfortably. So, we had to dismantle the beds after a few years. 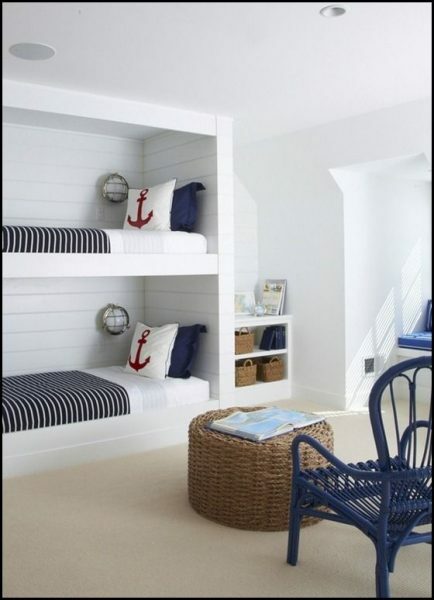 I like the one with the red pillows…looks like the loft we had in college. Lucky family in Tennessee!!! Have fun. I enjoy reading your blog, thanks for all the helpful information. 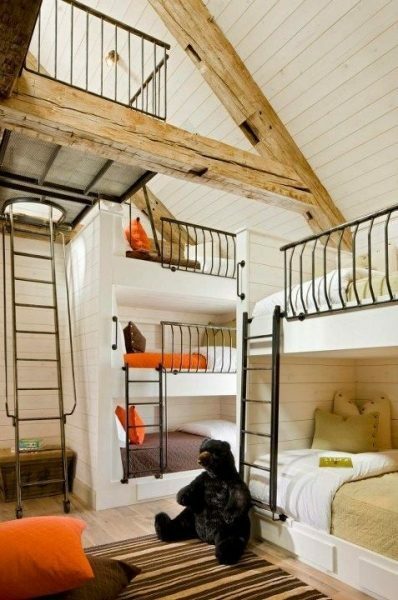 Like all the beds, but especially like the 4 beds with stairs in middle. 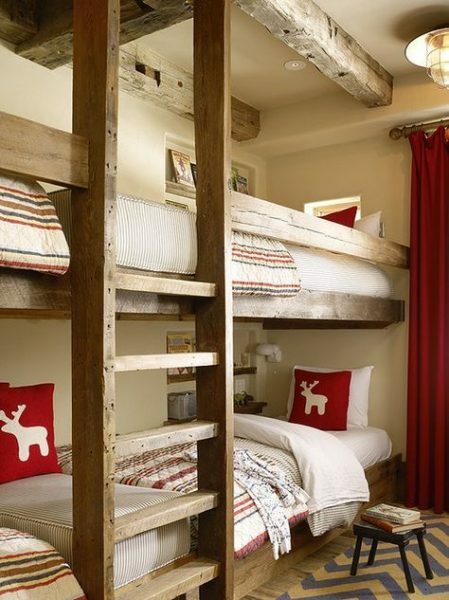 I like the one with the red pillows…looks like the loft we had in college. Lucky family in Tennessee also who gets the makeover!!! Have fun. My eye is drawn to that last one but every single one of those is fabulous! Can’t wait to see what you come up with! I love the last 2! Those are so cute. 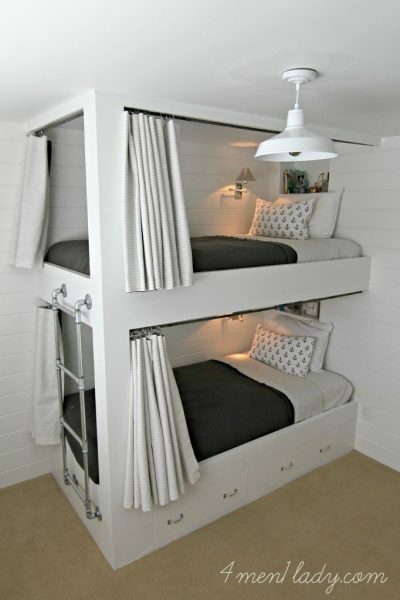 Love built in bunks.. I want them for my own bedroom but I don’t think hubby would approve lol. So excited to see what you do.. lucky boys! 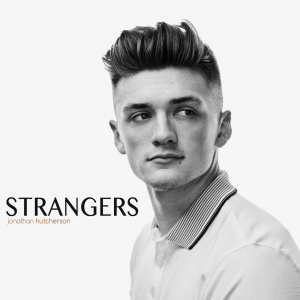 Just amazing! 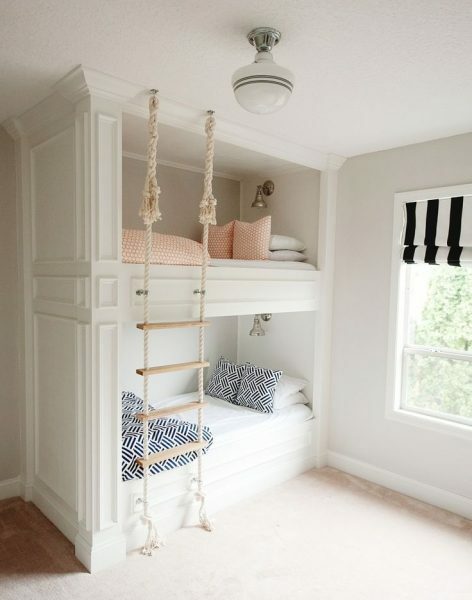 We have 3 kids and the beds in the last picture are perfect for them. 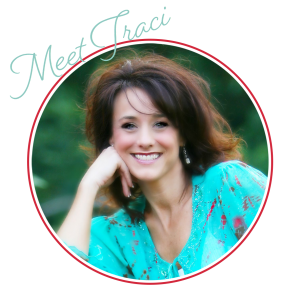 Thank you Traci for sharing! 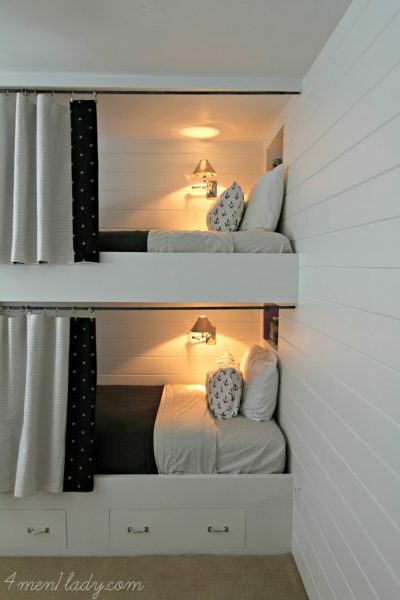 I love the stairs in between the beds in the last one. Can’t wait to see the end results! AND, I’m loving your new front doors, would you mind sharing where you purchased them? I like the ones from 4men1lady, but I’m guessing you picked the one with the ladder and railing out of pipe, since it will fit so well with the boys’ bathroom. I can’t wait to see the results. I have wanted to do this in my basement, but was not sure how high a ceiling we would need. Do these work with an 8 foot ceiling? I like those in the last picture. Though I’d change the bed lights – they remind me of old German submarine’s lights. Not very appropriate for kids room. 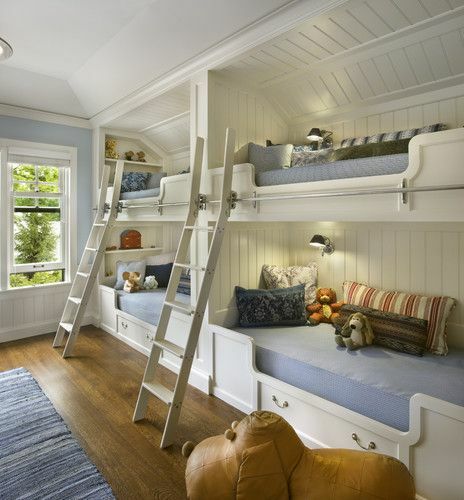 The beds with the lace ladder are so adorable. My kids are gonna love them. However, I’d probably remove the bed lights – aren’t they too close to children’s heads? !